Unless otherwise noted in a listing for a particular Property, the Auction will be a reserve Auction. The reserve Auction will have an undisclosed Reserve Price. The starting bid is not the Reserve Price. Except where prohibited by law, the Auctioneer may open bidding on any Property by placing a bid on behalf of the Seller, and may further bid on behalf of the Seller up to the amount of the Reserve Price by placing successive or consecutive bids for a Property or by placing bids in response to other Bidders. If no Bidder places a bid that equals or exceeds the Reserve Price, the Seller (or Servicer, if applicable) is under no obligation to sell or approve the sale of the Property. Not only can they open the auction. Not only can they bid. But they can successively bid. In other words, they can be the first bid, the second bid, the third bid and so on. They can be every single bid. They can bid as much as they want. I ran a Google search for a phrase from this text and found a handful of references to similar clauses. But Google runs out of unique results at page 5, so I feel like this may not be something a lot of people know about. Even though I hope everyone will read the terms of service and agreements for any platform they use, I know that some won’t, will miss things and gloss over others. If the seller won’t sell below the reserve price, what’s the problem with allowing the auctioneer to bid up to the reserve price? For one, it suggests demand that doesn’t exist. Yes, people “play the game” and get away with this sort of stuff all the time. Plenty of real estate agents suggest demand to try to push someone to make a bid or a higher bid. It happens and, yes, you should have your price in mind and don’t allow people to drive you higher. But that doesn’t mean it is an honest practice. How can you trust a system where this sort of practice is actually encouraged? I suspect that most people browsing their website wish the practice would be discouraged, that they would actively police it. Itself, they are doing the opposite. It creates a circumstance where the auctions they do reach the reserve price are just a game of catching the biggest sucker you can find, who believes in demand that may very well not exist. I hope no one would say “but it’s just like a counter-offer.” It’s not – functionally or ethically. This is not negotiation. This is an actual bid on an auction. Value changes. Real estate is reduced. If I bid $200,000 and don’t meet the reserve, then the seller can choose to re-list their auction with a lower reserve or just stick it out. That is the choice in ethical auctions. But if they get me to bid $275,000 because they bid me up that high, that creates a lack of trust in the system. It doesn’t matter if I was willing to go up to $275,000. You deceived me into doing so. That’s wrong. There is enough money being made here where you can put a modest effort into ensuring each person is a different, real bidder. Social security numbers, bank accounts, etc. Yes, it can be circumvented, kind of. But make people work to do it. Identify which bids are made by which account. You don’t need to identify the person or the username (you shouldn’t), but you can identify that this bid was made by account #1, this one by account #2, etc. Let bidders know how many people are really interested. Don’t allow the auctioneer or the seller to bid. If you ever find one doing so, make a public example of them and kick them off of your site. You’ll be the good guy, they’ll be the bad guy. I suspect that that this is a procedure that may be recognized as standard by some who operate in the real estate space – especially auctions – but that doesn’t mean that it’s a good thing or that it isn’t deceptive to the average buyer. It is hard for me to see a circumstance where a potential home buyer would read that clause in the agreement and think “well, that seems fair. I’m glad that is there.” Universally, one would expect that the response would be one of distrust. If you are HomeSearch, that’s not a good emotion to evoke, not with so much money at stake. I'm sure this is in the fine print, and most bidders on HomeSearch probably don't have a clue this is happening. If it was really visible and clear that they allowed it, I'd be surprised if they got much activity on listings. I certainly wouldn't bid on a property like this without being able to clearly see whether or not the property owner was bidding the price up. Doesn't this defeat the purpose of a "reserve price" anyway? Why not just up the starting bid? I don't get it. Yeah, I'm sure you aren't alone in those feelings. This text is in the middle of a 19 page (when read as a PDF) agreement. It's disclosed, but it's hard to think that this is a practice that most people wouldn't prefer was discouraged. Hi Patrick, a fine Irish name!, my great, great grandfather, James Patrick O'Brien, would approve. So I Google'd fraud with Homesearch.com and found you. I just naively, and to your point, with trust, participated in one of their auctions and went through the last 2 minutes "shilling " you reference. And equally as galling, got their CS on the phone as the reset new 5 minutes ticked away to find out after having been in conversation with at least 6 of their CS staff in the weeks preceding the auction, that, in fact, you cannot bid from a phone or tablet!!! Never once mentioned nor obviously NOT VERY OBVIOUSLY POSTED ANYWHERE!!! Perhaps, ultimately to my benefit by excluding me from bidding again as the price went up. I was input "manually" by a CS rep two hours before the auction ended this morning but never a word about the phone being the problem with my being blocked from bidding. I have threatened them with State Attorney General's Office, social media and "Call Kurtis" consumer advocate on CBS. Here is my experience. Just one week ago I was bidding on a house on homesearch auction site. I kept getting out bid. I could tell it was one bidder against me for the last 30K it went up. Finally I stop bidding so I lost the auction. At this point I was somewhat glad I lost because I was bidding higher than I wanted to pay for the house because I got caught up with the auction. Yesterday someone from Homesearch called me. He asked if I was still interested in the house at my last bid price since the other bidder wasn’t able to get the financing for the house. At first I was happy but I told him I had to think about it. After doing some research I find out they were bidding up the price?!? So I was lucky I stopped when I did and they don’t have a real buyer. I am still interested in the house but I am not going to pay the inflated price. Their process might be legal but it seems like an unethical practice and I don’t want to deal with someone that I can’t trust. I had a similar experience, about which I have posted at length. I was supposedly the underbidder at the auction. I had gotten auction fever and bid more than I had intended, so I was somewhat relieved that I had not won. I was also disappointed because I really loved the house. A week later, I got a call from a representative of Homesearch. He told me that the winner had not submitted his paperwork, and asked if I was still interested. I said Yes. My husband and I proceeded to negotiate the price, since they would not negotiate on terms. The representative said that if I could tell him the next lowest bid to mine, he could negotiate between that figure and my highest bid. I had written down every bid. We got the house for $100 above the bid BEFORE my highest bid, and saved ourselves about $8,000. There seems to be very little information online about homesearch.com. Thank you for posting here. We are currently bidding on a house on this site. We are the "high bidder" but have not hit the reserve. This is an auction that happened approximately 1.5 weeks earlier w/ the same starting bid that we put a bid in on the first time. However, last time we assumed that the bank bid us up the 10,000. bid increment and we let it go (this was w/out hitting the reserve). This time, the bank hasn't touched it and we are just the high bidder w/out reaching the reserve. Any ideas as to why they wouldn't bid us up? Seems like they are playing some type of banking game. We were well aware that this is their policy and is clearly stated in the fine print on their site, but are confused as to why they wouldn't try to up the bid and get it at or near the reserve. Does anyone know if the bank will actually hit the reserve, or do they stop just before? Any information would be highly helpful. Thank you. Hey Lorin: Can you update if you were able to get the house even if your winning bid didn't have reserve not met state ? did you complete the transaction with HomeSearch.com ? Hi Shawn, Yes, I will post an update here, but I need a couple of days so I can post an accurate account of our dealings from the last few months. So, we were able to purchase the home we were interested in per my previous posts. It wasn't terribly easy, but as it turned out, we went around the usual bidding system. That being said, we were aware that the only way to buy the house was through Homesearch.com. We signed up for the bidding process and went through various weeks (3 or 4 auctions) of bidding w/o hitting the reserve, but also having someone bidding against us and we stopping our bid at our high price. We did not hear from the company after each auction. We then decided to contact the listing agent on the MLS in between auctions to find out what more we could do. We were able to speak w/ her . She then took the reigns from there and submitted our high bid to the bank, which they accepted. So, my advice is to try like hell to get in touch w/ the listing agent on the ad on the MLS... not homesearch. Our agent, of course is affiliated w/ HS and also deals only w/ forclosures. If you are thinking about purchasing a property through this route, I would highly recommend that you live in the area and are able to get in the home w/ an inspector and any other (plummer, electrician, building inspector etc). Our experience was difficult and the bank takes no reponsibility for anything that is wrong or possibly could go wrong w/ these homes. We lived 30 miles away and were able to get in the house. Do your homework and get to the county courthouse and find out about it, leans, etc. We do love our new home, but it wasn't as simple as it seems it should have been. Lastly, I have no issues w/ HS that are negative really. They are very clear in the fine print as to how they do business on their auctions, it's up to the buyer to understand their system (being deceptive or not, but not illegal). Hope this information helps someone. So sorry, I now see that you have posted that up top. So it sounds like homesearch.com will go ahead and hit the reserve on their own if bidding against you. Just trying to get a grip on this relatively new site and still would love any advice and input on our situation. Don't want to bid against ourselves and I have heard that if you don't hit the reserve, the bank has called some bidders to offer the property on their high bid. Thank you. Just finished the bidding process myself. This is what I noticed: 1. The automated system kicked in and bid every few minutes in the last half hour until the reserve price was met. I helped along the way, but evey time I bid time was added to the clock. 2. After the reserve price was met I made a bid to be the high bidder in the last 1 minute. After the bid I made five minutes was added. 3. At about two minutes left someone or something outbid me, but no time was added. I assume that because no time was added it was the "shill billing" or automated system trying to trick me into a higher bid. Based on this blog post and other posts online I am waiting for a call saying I can buy the house. Perhaps I am all wrong and someone simply got preferential treatment on their bids because no time was added when they bid. I am highly disappointed by the dishonesty of this site and will be writing the realtor to inform her she shouldn't use them anymore. Bo, please keep us posted as to whether you get an offer despite being "outbid". I received a call from the Realtor three days ago saying the house is now mine if I accept the final offer. They were told by HomeSearch that the first bidder backed out. I had the Realtor ask why the first bidder did not have time added when they made bids, HomeSearch quickly changed the subject. We are now waiting to hear back from HomeSearch to start the final process. Interestingly in the last three days the property has been relisted as Foreclosed again, and the price has changed??? I received such a call, and bought my house. Hi- Nancy did you ever receive a call regarding that house? Hmm, not liking what I see here. I registered for an upcoming auction , 10/26, in hopes I could win the bidding process on a home my wife has loved for the past 18 years. I naturally started my homework on this property, only to find the pictures of this home listed on their website, is not the REO property at all. They put a picture of the nicest house on the street, when the actual property is 4 houses down, and NOT the dream home we thought. When I try to notify them of this mistake, I was told they have nothing to do with that. If it's too good to be true, it usually is! In January we bid on house through another auction site and won bid the house was owned by Nationstar mortgage llc which is an affiliate of Homeseach. Day before the waiting period was up they sold home to a broker in a lot of properties. We then started the bidding process to buy through the brokerage. Only to find out week after getting signed contract in August that they were selling house back to Nationstar as could not get a good title. Nationstar never forclosed completely on property. They now have title in their name and are selling on homeseach as auction. Love the property but are so scared to bid after reading all these posts. This is going on 10 + months. We have been working with a realtor this whole time and are sure he is as confused and frustrated as we are. Any advice? WOW! You just can't trust ANYTHING on the internet. This is NOT an auction at all. It is in fact a fraud designed to allow a person to "think" they got a deal when in fact they got RIPPED OFF. Seems to me that it should be ILLEGAL to allow anyone to set up a web site that has as its basis an intent to commit FRAUD. For example, if anyone on E-bay was caught bidding up their own product they would be banned from the web site. Thank you for posting this! I had no clue. I'll add my experience to this. Just yesterday I was bidding on a home through Homesearch.com. The reserve was met early on . The last hour, I was glued to the computer keeping an eye on things. Things got sticky on the last minute. I was the winning bidder and when there was 15 seconds left, I got outbid and 5 minutes where added. I had my realtor on the phone with me the whole time and she tells me she hadn't experienced anything like this because this cycle went on about 6 times. I knew 5 minutes will be added so I didn't wait till 15 second mark I will just bid and wait- then sure enough at exactly the 15 second mark when I was about to yell "victory" I will get outbid and more time added- until i finally gave up and threw the computer mouse with frustration. It was crazy! Now- if it was a real bidder"congratulations to them" but it was so perfectly calculated at the 15 second mark, that this really made me feel as if it was automated. Why would a real bidder wait till the 15 second mark time and time again for 6 cycles knowing it's just going to add more time. My realtor, who assured me she had never experienced "shill bidding" was in awe, because she experienced this with me. She called her broker and the broker told her that "no, they wouldn't do that." She proceeded to call the auction house and they said that they absolutely have the rights to bid for their seller. They couldn't say if that was the case in my experience but told her to give it a few days and call back and they will know if there is in fact a real buyer. Hurry up and wait!!!!!!! I believe Homesearch.com just gets these bids to sell very bad properties in this format were the buyer does not get to inspect the house. Best plan: go to the property and check it out, note the agent on the for sell sign (also on RE/Max site page for house if listed). Determine what you are willing to pay for that house, drop that number by 20%, call the agent and give them a cash offer. And forget Homesearch.com! Hello everyone. I just found this site/post and find it very interesting. I have personally bid on 5 homes and actually purchased 2 homes on Homesearch.com. I am a licensed Realtor. You are all correct. Homesearch does bid their own properties up, and it does not stop at the reserve. It's easy to tell, because bids come at the same time increments. I bid on 2 at the same time a few weeks ago and got outbid notifications at the same time in my e-mail. Both of the homes I have actually purchased, I did not win the actual bid. I was outbid both times. In both cases, Homesearch called me three days later, said the winner dropped out, and asked if I wanted to buy it. I the first case, Homesearch asked me to pay my last bid. I said yes, and purchased the home in 4 weeks. The second time, I bid I went over my intended top purchased price of $45k up to $52 k. They called me with the same claim, that the buyer dropped out, and offered it to me for my last bid. I had just bought something else, so I told them "sorry, but I bought something else. I can only go $45k, because that's all the cash I have left. " It took them a week. They said they had to check it with "the investor." They accepted it at $45k, and I bought it. Recently I bid for a client on the same home in 3 consecutive auctions. The home wasn't getting up to the reserve, so they just kept re-listing it for auction until they hit reserve-on the 4th auction. We didn't get it. About 2 weeks ago I bid on two for clients at the same time. Neither hit reserve. I didn't get a call on either. Both homes are now re-listed. I'm bidding again in 2 days on both. In the two cases that we actually bought the homes, we didn't have any issues after actually signing the contracts. Closing is simply faxing documents and wiring money. NOW-all that being said, I was terrified that this was a scam the first time I bought one. But, being a Realtor I could research the home and determine it was legitimate. Also, Homesearch only pays Realtors 1% commission, so you may find it difficult to get a Realtor to even work with you to buy one. Here's the math-on a $100k home, a Realtor usually makes 3%, or $3,000. Half of that goes to his/her brokerage, so the Realtor makes $1,500. In this case, Homesearch offers a 1% commission, equalling $1,000, so $500 to the Realtor. Homesearch basically is discouraging buyers from even being able to get help. Because who wants to work for 1/3 pay and do double the work??? I do help clients buy on Homesearch, but the only two I have actually sold are the two I personally purchased. It is critical to know the values of these properties and have a maximum bid beforehand. To do this, you can go to the auditor's site and look at what has sold around that home. Or call a Realtor and see if they are willing to assist you with the purchase. Tell them it's a Homesearch home and the commission is only 1%, but look at the bright side, they only have to show you one house and do a market analysis on one home. I don't agree with the policies they use, but you can occasionally get a good deal if you are diligent and careful with your bidding. As I mentioned above, I'm a Realtor, and even I got caught up with bidding and went $7k higher than I wanted, because I really wanted the house. It's right beside OSU, and I was buying it for my daughter to live in at OSU. So….even professionals occasionally lose their senses with these auction homes! Dina, I am also an agent. I just purchased a home for myself on Homesearch. I had called their customer service number because I also wanted to know whether to put myself down as agent or homeowner. They said to put myself down as a homeowner. I was also able to put myself down as my own agent on the registration form. You can do both. In concurrence with your review: I can confirm this is what they do and did on the auction I participated in. They should disclose WHAT the reserve price is (though that price is though NOT mandatory) so the Bidder can decide if he wants to participate at all. A reserve price (as it was in the auction in which I participate) and unknown to me or other bidders, far exceeded even the retail market value of the property if it was NOT substandard (as it was) with severe "material" defects. No one (including the winning bidder, who refused the the reserve price set by the mortgage holder-lender) would have even been willing to bid, if they new how high the reserve price was. PS: I believe the minimum bid was set by the auctioneer, from the current, free marked buyer's offer price contracted with the homeowner. What the Event Agreement Says Unless otherwise noted in a listing for a particular Property, the Auction will be a reserve Auction. The reserve Auction will have an undisclosed Reserve Price. The starting bid is not the Reserve Price. Except where prohibited by law, the Auctioneer may open bidding on any Property by placing a bid on behalf of the Seller, and may further bid on behalf of the Seller up to the amount of the Reserve Price by placing successive or consecutive bids for a Property or by placing bids in response to other Bidders. If no Bidder places a bid that equals or exceeds the Reserve Price, the Seller (or Servicer, if applicable) is under no obligation to sell or approve the sale of the Property. Can you read a lack of transparency and a con game in the above disclosure? Thank you for the comment, Steve. I'm pretty sure that is the case with all real estate listings. That's sort of the whole idea of staging. That doesn't mean you don't have to disclose issues (and that's also why inspections are so important). I wish to add my bit to this discussion, as it only serves to help those of us trying to find help/information about these unfamiliar sites.... I recently placed a bid on a short sale property I have been looking at for the past 2 months. I actually put in 2 paper offers through my agent, one that was rejected outright, and the other "being reviewed". Bear in mind that with my offer in hand, we were still told that the property was being sold on Homesearch and that we should bid there. It was placed on auction twice with NO BIDS placed. I just watched, didn't even register to bid because I didn't want to gin up interest in a property I otherwise had an offer on. Anyway, it came back on the site, and on the last day, with a few hours to go, my agent called and said the price had dropped significantly, almost $100K below the originally listed price. He advised that we register and bid, since the bank informed him that it was the only way for us to buy (the were no longer "reviewing" our offer). SO, I registered, and sat staring at the computer at the 1hr to go mark. At precisely that time an offer was put in, and another immediately after (that made no sense because to me, as a real buyer, I would wait until the very last minute to bid because I would not want to drive the price too far beyond this really sweet starting point!!!) Anyway, 2 bids came it, I'm seeing action, so I sit watching. Nothing else happened until the last minute when I put in my very first bid - with 10 seconds to go! As I expected, a counter came in immediately... no cooling off, no waiting to see the clock go down. 5 minutes were added and again I waited until seconds to go and the same thing happened again. I knew I was bidding against a straw bidder so I just immediately placed bids and was countered until I got to my max, I was not gonna be pushed a cent higher. This happened 6 times, and I guess the straw man realized I wasn't playing nice anymore, and I was the highest bidder at my max. For every time I was outbidded, I got an email saying that I was. When bidding finished and that little green font said I was the highest bidder, I expected an email saying that I was.... no such luck. I called Homesearch the day after to find out what's next. They need to hear from the seller whether they accept my offer. I know the seller was willing to accept my paper offer at an amount higher than what I bidded on this auction, it was not the seller's idea to sell on auction, this was Nationwide's doing. Who is the seller they are referring to here? The owner or the bank?? The $2500 hold is still on my credit card and is gonna be there until I hear whether the seller accepts, which could be 15 days I'm told!! The house is a deal, and my winning bid is 20K below my higher offer that was being "reviewed". I have decided that if the bank tries coming back to say they are accepting my paper offer, I'm declining. GO sell it at auction again and I'll bid 20K less than where it is right now and then see who wins this game! This is silly, and I hate the lack of transparency and fairness, as I'm reading in these comments. I promise I'll come back with my update. And others who were waiting for action on their bids, can you please come back and say how it turned out? Lorin? Bryan, did you bid?? Thanks guys, and thanks Patrick for starting this. Thank you for sharing your experience, Mayne. They released the fee hold after the auction end since we didn't hit the reserve and the auction ended. We then persued the other avenue. Another update guys. We are under contract, at the 20K less than my paper offer. Still some time to go but this is good progress. We decided to use an escrow company recommended by our agent, and not go with Homesearch's suggestion. So far things are moving along smoothly so will let you know when we close. Wish us luck!!! Mayne - I know it's been only 5 days since your last update - but please do keep posting your experiences! I just placed a bid and received a call that I also was highest bidder because the bidder after me could not fulfill and the property was now available to me. Seems too good to be true after reading all of these reviews......more negative than positive experiences. Thanks! Hi all, This is a terrific discussion, and I feel I am now well armed to deal with homesearch. Stick to my max. I recently bid on homesearch.com for a property I tried to buy at short sale over two years ago. Since this is a very small apartment and I have been following it for so long, I was pretty sure there would be very little demand. Entered the auction in the last 15 minutes, and after each bid time was extended and I was outbid. After this happened a couple times, my agent told me I was probably bidding against Nationstar. I was furious., but made one more bid a bit over my max. I know, I shoulda read the fine print, but I never imagined the site could be so crooked. After Reserve not met, the auction was relisted the next day. I'm going to bid again, but this time I'm going to stick to my max, which I have reduced since my idea of low demand for this place was demonstrated by the straw bids. Thanks for all your comments, they are extremely helpful! This has been very helpful during my research. Just want to add my experience. I was able to win an auction on this website. Waiting for bank to contact me now. Last update guys.... We closed and should be getting keys tomorrow, after that it's dealing with a massive cleanup and reno job, but looking forward to it. I came to drop my update now cause I know I wouldn't be sitting at a computer anytime soon. All in all, I'd say it was a pretty smooth process once my highest bid was confirmed and accepted. My agent was amazing and managed to get all liens negotiated in a rather timely manner, and the bank did pay the liens from the final sales price so there's no worry there about not getting clear title. A good tip would be to work with someone who's comfortable with and understands the shortsale process. There were things my agent was ahead of that the seller's agent hadn't a clue about, so my guy basically took over the negotiations. Good luck to everyone embarking on a homesearch bid. This could be a terrific opportunity to get in on a great property at a terrific price, just know your own limit and don't be pushed beyond it. And remember to factor in the auction fee ($3500 or 3%, whichever is greater). Take care all. good news Mayne, I hope I'm so fortunate. An update from my end: After discovering that there were fake bids in the auction, I filed a complaint with the Washington Attorney General, as homesearch’s self bids appear to violate the consumer protection code of the state. I received a message from the AG office stating that they were following up on my complaint. Then last week I bid on the property’s second auction, but I kept my bid much lower, because in the first auction I had exceeded its reasonable value as distressed property. Also, after finding out the company was making fake bids, I figured there was actually very little interest in this property from any other legitimate bidders. There was one bid after mine, the auction closed, and the property was listed for a new auction the next day. Today I received a call from an attorney at homesearch to discuss the property and the AG complaint. He said that my bid in the first auction (144K) was perhaps one he could bring to “the seller” even though it was below the reserve, but my bid in the second auction of 117 was probably too low. I told him that he could ignore the first bid, and the second reflected what I thought the property value was. Regarding the AG complaint, he stated that their practices follow auction law in that homesearch’s disclosures of their bidding procedures allow them to place their own bids. I quoted Washington code which says “(3) At a public auction conducted or supervised by an auctioneer or auction company, the auctioneer or auction company shall not fictitiously raise any bid, knowingly permit any person to make a fictitious bid, or employ or use another person to act as a bidder or buyer.” At that point he said “its inappropriate for us to discuss this, and we have to close this call”. Thank you’s were said and that was it. I plan to bid at the next auction . . .
That is really interesting, Tom. Thank you for sharing. Tom, Whatever happen with your complaint against Homesearch with the AG of Washington State? My wife and I have been bidding on a house in Vancouver Washington on Homesearch.com, but have been out bid or when were the highest bidder we didn't make the reserve. We believe were the only one bidding each time and Homesearch is bidding us up. We have taken video of the last three auctions and are thinking of turning them in. hi, just reading everyone's comments. I have been doing my research as I am bidding today on home search. I have watched the auction for 2 days jump in price and I was curious if it is the site auctioneer or potential bidders. I will let you all know how my experience goes as of right now I have already had problems signing up and they put a hold on my card and it wasn't letting me sign in to bid but kept telling me to register to bid. The 1800# did fix my problems but it wasn't simple. It took a hour for the site to figure out the glitch. I just closed my purchase with Homesearch last Friday. Everything went smoothly. You have 48 hours to accept the offer and need to show proof of funds. Otherwise it goes to the next highest bidder. However proof of funds can be just a letter from your banker stating you have that much money. In my case, I transferred money to my account for 2 hours until the banker issued me the letter then I transferred it out. You do have another 2-3 weeks to close. Mine was cash purchase and closed in 10 business days. The bank gave me $1000 for early close. I hope this is helpful to you. Good luck! Appreciate you answering this, Jenny. Thanks. Just a quick update: I was highest bidder on a short sale property - auction close date was December 30th. The property owners (Sellers) have signed and approved the short sale offer and we are under contract. However - the Seller's Lender still has to approve the short sale. We have opened escrow and deposited Earnest money of over $10K, have our financing in order and now we are sitting ducks waiting for them to give final approval to move forward. IF in fact we do complete this transaction - we will end up getting an amazing deal on a great property. Keeping fingers crossed we make it to closing. As of now - we are into the process a little over 30 days so far. I see a lot of feedback about REO properties purchased through Homesearch - not too many are Short Sale properties in this forum. Another update - we are now 4 months past the date of our offer through Homesearch.com and we just received short-sale approval. We will be closing in 2 weeks. On short-sales, Homesearch.com does weird things with their bidding and then after an offer is submitted - it's pretty much out of their hands. I had called on a couple of occasions for updates and Homesearch was not able to help since it was up to the lenders to make final approval on the offer. Overall - good experience - it just took a long time! Suzi, I'm curious. Was the lender Nationstar? I have had two recent experiences with Homesearch. They were as different as night and day. For the first, I was an agent bidding on behalf of a client. We did not start bidding until close to the end of the auction period. After our opening bid and after several subsequent bids by ourselves and what seemed to be other bidders at irregular intervals, the site indicated that the reserve had been met. Bidding continued. It seemed that other bidders dropped out, except for one other interested party. The required minimum bid increment went from $7500 to $5000 to $2500 to $1500. One last bid, and we stopped. There were a number of minutes left on the auction clock. We sat and waited. The clock ran out. My buyer won. For the second, I was bidding on a home for myself. The starting bid was set very low, so I placed several consecutive bids on the first day of the auction in order to discourage bottom fishers and hoping to discover the reserve amount. That may have been a strategic mistake. Possibly the auctioneer could have identified me as a seriously interested party and decided to manipulate me, which is what I feel happened. Placing a bid is a process involving several steps. The online auction page displays the current high bid and the required minimum bid increment. There is also a clock which displays the amount of time left on the auction. First, you click a button on the auction site which says “Place Bid”. A window opens up which displays the current high bid, the required increment, and the amount you will be bidding if you click a new “Place Bid” button in that window. If you click the button, another window opens up which has a button labeled “Confirm Bid”. If you click that, another window opens up which says “Your bid was accepted” and “You are the high bidder.” A second later, your bid appears on the main auction page as the high bid. This whole process takes at least 10 to 13 seconds, and possibly more. Several times, after I placed my bid, a message appeared in about two seconds which said “You have been outbid.” I feel that no human could have placed a bid that quickly, so I believe that Homesearch was using an automated shill bidding system to get me to raise my offer. One time, I placed a bid using the standard procedure and saw a message which said “Your bid is too low. Bid again.” It could not have been too low, since there was only one possible bid, and that bid met the required minimum increment. Perhaps someone else bid at the same exact second. Or perhaps the shill/auctioneer was a little trigger happy. My auction was supposed to end at 2:15 PM. The Reserve was met at 2:08 PM. The auction clock kept resetting and adding minutes, usually in five minute increments. Once, it was seven minutes. In one instance, the time was extended twice without anyone bidding. The minimum bid increment went from $3500 to $2000. It did not go lower. I placed my last bid around 3:05 PM, having waited until the auction clock had 19 seconds left to run. I clicked “Place Bid”. The bid window opened up, displaying the current high bid and minimum increment. I clicked “Place Bid”. The next window opened and I clicked “Confirm Bid”. The next window opened which said “Your bid was accepted” and “You are the high bidder.” On the main auction screen, the clock ran out. Under the clock was the word FINISHED. I felt a glow of relief and happiness. THEN THE CLOCK ADDED ANOTHER FIVE MINUTES. Another bidder went up another $2000. I had reached my maximum, so I stopped bidding. The clock ran out again. Under the clock was the word FINISHED. It did not extend again. The property which was the subject of this auction is in Maryland. My husband and I are both Realtors. We are required to take certain Continuing Education classes every two years in order to renew our licenses. My husband was unable to be by my side because he was in a required CE class, which happened to be Maryland Code of Ethics and Predatory Lending, taught by two real estate attorneys. He asked them whether shill bidding at an auction was legal in Maryland. It is not. I believe that Homesearch violated the law by shill bidding during that auction. I also believe that adding time after the clock had run out was at least unfair, and possibly illegal. This was not a good experience. If you bid on a property on the Homesearch site, please document every move you make and the site makes. Take screen shots. An auction is an auction, but it should be fair. Policies and procedures should be consistent. The public should be protected. I intend to refer this to the office of the Maryland Attorney General for review. great post Ellen! I filed a complaint with the Washington State Attorney General, and I encourage you to do the same in Maryland. In Washington, they basically facilitate a mediation process, and make no guarantees after that. If the AG decides to pursue litigation, they do not notify the complainant until the case is settled. I sure hope they are suing Homesearch, but they haven't given me any indication one way or the other. I definitely got the atttention of Homesearch for a while though, even got a phone call. I continue to bid on the property I'm interested in, 5th auction coming up. They have over-valued the property, and my max bid has never reached the reserve. With their shill bids, they are inventing demand where there is none. Imagine if you, as a realtor, submitted an offer on an MLS property, and the seller's agent replied by inventing a higher "counter offer". I bet this is prohibited pretty much everywhere, but this is exactly what Homesearch does. They make their bidders put up money and prequalify to make sure they are serious, and then place fake bids themselves. Yes, only Homesearch has the right to make frivolous bids! Follow up post: About a week after losing out at the auction, I received a call from Homesearch. They told me that the high bidder had not submitted his paperwork, and asked if I was still interested. I said Yes. My husband and I proceeded to negotiate on price, since they would not negotiate on terms. The representative told us that, if we could tell him the amount of the bid prior to my highest bid, he could work with us at a figure between that bid and my own. I had written down every bid. We got the property for $100 above the prior bid, which was a total of $8,000 savings for us. Has anyone had the experience of having the bank accept an offer that you won at an auction that did not meet the reserve? I need to also report what Homesearch is doing. This is specific for short sale Auctions. I am short sale negotiator to the listing party. 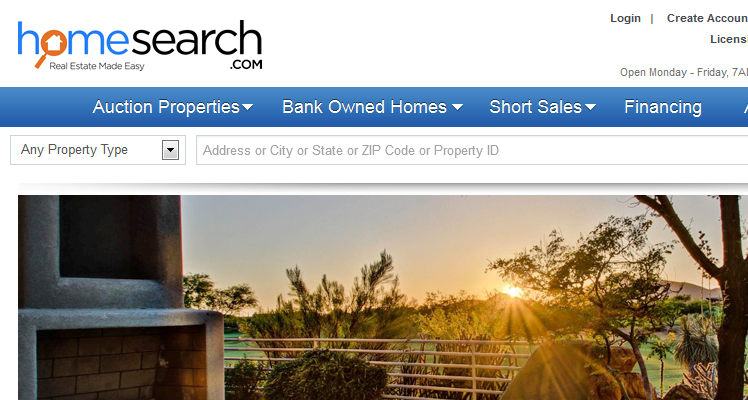 Lender (Nationstar) decided to proceed with short sale via Homesearch Auction. We have additional liens on the property for $50,000 by HOA attorneys. We reported this to both Nationstar & Homesearch. We have done all required by our Department of Real Estate reporing the lien on MLS. Buyers and Buyer's agent were calling Homesearch before Auction asking about liens. Buyers were always told that Lender (Nationstar) will be paying for those liens. We even have it in writing when an offer was accepted and was included on Purchase Agreement- Now lender will not comply with this. They will not validate what Homesearch was telling buyers...The result Homesearch & Nationstar are going to send seller to foreclosure. I have closed over 150 short sales and negotiated very difficult ones. My philosophy is to communicate and be HONEST...which this company is NOT. I would love to take this to proper Federal, State and Housing authorities...Any help in how I could bring this up? Juliet, I had an experience much like Ellen Levy above. I had participated in a number of auctions for a specific property, and I believe I was the only serious bidder, and Homesearch was entering almost all of the other bids. At the fifth auction on this property, I decided I would increase my max by 10k because I really wanted the property. I was the high bidder, but had not met the reserve. Several days later I was contacted by HS, asking me what my best and final offer was. I attempted to offer them my last bid, MINUS THE PREMIUM, but was told I couldn't do that. I capitulated, submitted all my documents and earnest money, and now I believe we are a week or so from closing. Tom, I was the underbidder. When HS contacted me a week after I lost out, they told me the high bidder had not sent in their paperwork. They asked if we were still interested. We were. I handed my husband the phone because he is a great negotiator. He asked about negotiating the price. The HS negotiator told us that, if we could tell him the bid PRIOR to mine, he could negotiate between that bid and mine. I had written down every bid. I told him the figure and he agreed that I was correct. My husband then offered $100 above the next lower bid and it was accepted. We did have to pay the Buyer's Premium. I found your page very informative while exploring WA State bidding procedures for Real Estate Auctions. I was wondering why the increments are usually 10,000 to up bid and sometimes 25,000. Isn't this usurious and illegal. I suppose the Auction.Com site also does the Auctioneer bid thing and finding many inconsistencies in their operation. Any comments please feel free to email me. This was my first time buying with auction on a foreclosure, so I was caution but did my homework, title search and $500K cash. I did not get the bid, but it was a good learning experience for me. I will not participate in homesearch.com auction again. This is what I learned. The auctioneer and bank owner (foreclosure) holds ALL of the knowledge and assumes none of the financial risk. The Auctioneer also has a set minimum price to meet in agreement with the bank or owner, obviously, both the auctioneer and bank want a high price, the auctioneer for 5% commission and bank/owner to recover money and then some. The auctioneer also has visibility for ALL of the bidders involved. The buyer assumes ALL of the financial risks and is buying "AS IS". Obviously, a buyer wants the lowest price and has to guess on fair market price, and has no idea on what the bank and auctioneer have agreed too, all part of the game. Auctioneer has good salesmanship - the starting bid is very tempting, and attractive - exactly what it is intended to do, but for the most part the auctioneer increases the bidding up until the last 1/2 hour, and even then, a person may find him/herself bidding against the auctioneer depending on interested parties up until the last. It is evident to see from the bidding increments and lapse of time that the auctioneer was up the bidding in order to position the price to the pre agreement or acceptable amount. The auctioneer also controls the clock to what every he/she wants it to be towards the end of bidding. In my situation, the clock kept resetting within the last 10 minutes, extending bidding about 20 minutes more, a little frustrating, because, the home was not getting the bidding cost moved up to the auctioneers satisfaction, which also caused me not to bid until closer to closing time. Upon closing, I submitted the bid and got what I believed to be the final bid, the computer even started processing the closing bid, so it looked good, but HOLD ON, the clock restarted another bid came in after time expired, so I didn't have a chance to re-bid, What I believe occurred is the auctioneer entered another $3.5k increment, while mine bid was closing out, which means the auctioneer was not meeting the cost price acceptable for the bank owner. It didn't end there, when logging on later to Homesearch, and after all of the time and public bidding was done, no chance for me to bid, a cost was agreed too behind the scenes, another $18k added to the home, nice salesmanship, and nice behind the scenes negotiations, but the cost would have been too high on a market value considering the 5% auctioneer commission, another 10% closing cost and occupant/attorney fees, and another $50K fix up cost for the home. So, I hope the buyer was prepared to pay for all of these additional fees - not seen in the bidding process or final bid price. Lessons learned; Auctions prices are very deceptive from the actual cost you are going to pay (additional costs), so you might as well buy through a relator and negotiate down instead of an auction were costs go up and some people get emotional. Homes on auction, especially foreclosures are in poor repair and require higher fix up costs, with Auctions, you are not even able to pre-inspect the property, so you have a higher risk factor to add to the purchase price. Chances of getting a home from Homesearch.com at a good price is a very small percentage, especially considering, Homesearch can change the rules anytime they want. It is like playing Vegas, one in a million, you might win but it is not worth all of the research time expended on an auction. I guess nobody wants my money. Just finished my second online auction with the same property on homesearch.com. I won the bid both times but the 2 mortgage on the property is holding everything up. Once again I have to go through all the hoops in the hopes of ownership.....One problem though, the house can't be sold until all liens are off of it. But they will keep posting this for a short sale when in fact they have to foreclose on it to rid it from all liens. I also felt that the website was boosting the bid amount after I joined in. there is no way that anyone else would have been bidding the way it was going, had to be the site/seller. Getting a deal but it would be nice if this shady crap wouldn't happen. I have to see if this practice is legal in CT? The seller pretty much can do whatever they want no matter what happens in the auction so beware...its their game and they will win! I have bought 2 properties from homesearch.com. I have bid on probably fifteen others. I do my research before the bidding starts and set my price before. I do not let others bidding on the property sway my price. I have been called as others to buy a property after I was outbid. Whether a game of schilling or not, I know what I'm looking for and willing to pay. That makes any business I do with them acceptable. I have told many people about them and though the schilling is wrong, if you go to auction with your head and not your heart, you will come out doing very well for yourself. Patrick, hello and thank you for this, am so glad I found this thread as I have been pursuing properties through both Auction and HS since November of last year with similar results as described. I am curious what happened in the Maryland complaint for one thing and am also curious if you have any personal experience with this process or have affiliation with any online auction services? I have tried also the storage unit sites and found they operate very (shady) similar ... the differences between online and onsite auctions are extreme. If anyone knows what happens to the properties that are leftover or bundled due to perceived lack of suitable bids, I would be very curious about that as well. Hello All, I am a realtor who purchased a home through an online auction site. Not homesearch, but another prominent site. I will tell you, even with my background in real estate and the full force of a familiar title company and real estate attorney, it was a scary prospect. As others have mentioned, there were automatic bids placed, but I did understand that this would happen. My husband and I determined what our maximum bid would be and stuck with it. In fact, we were one bid short of hitting our maximum when the bidding stopped. By that I mean, there were no further bids. There was still at least a day left to the auction, but no other bids came in, so it was unnecessary for us to bid further. Our last bid still did not meet the reserve price, so we assumed we would not get the property. Within 30 minutes we received a call from a representative congratulating us on having the high bid on the property. My husband blurted out, "But we didn't hit the reserve. Do we still get the house?" (Once we realized the bidding did not meet the reserve, we resigned ourselves to not getting the house and we were fine with that --- we have learned not to get too emotionally involved with real estate). The representative told us that when the reserve is not met, they present the offer to the seller and the seller decides if they will accept the bid or negotiate it. We knew we wouldn't increase our bid, as we had pretty much maxed out what we were willing to pay ($2,000 shy). We felt it was likely the sellers would come back to us in a few days to ask for more money, but we were wrong. In about 3 days from the auction end, we got a call from the representative stating that the sellers were accepting our bid. They then asked that we send in our rather hefty earnest money check and we did so. The rest of the process was a matter of going through the motions with the paperwork, loan, etc. There was a lot of faxing and emailing, but we got it done. One bit of advice I would offer is to have your own title company / real estate attorney lined up. These giant banks/sellers/government usually have an assigned attorney in your state who handles their auction property sales, but you CAN have your own title company work with their attorney. That can give you a bit of peace of mind because you have someone specifically representing you and if you choose someone local, you can deal with them face to face. - something I always recommend. All in all, it was a good experience for us, so I wouldn't discourage anybody from doing it. I would just say that it's best to do your due diligence, VIEW the property if it's possible (sometimes it is, sometimes it isn't) be prepared to do repairs (oftentimes homes are left empty for at least part of the winter and if the plumbing hasn't been winterized, this could cause major plumbing issues in very cold areas - so just go in with your eyes wide open.) Know your absolute max price and be prepared to walk away. Do not become too emotional (which happens a lot) and get caught up in the bidding frenzy. Don't 'fall in love' with a house so that you lose all reason and perspective and employ an "I've GOT to have it!" strategy with your bidding, lol. (Most homes aren't that unique. Another one very similar is usually out there. That said, sometimes you do come across the rare gem that truly is unique and it very well may be worth going for.) Having an attorney that specifically specializes in real estate is, imo, well worth whatever cost you need to pay. Attorney's generally aren't as expensive as people believe them to be, and the peace of mind of knowing that you have one on your side is well worth the price, in my opinion. Also, they are probably already familiar with the documents and procedures used by online auction houses, so the time they spend will likely not be terribly unreasonable. It was a nerve wracking procedure for sure, but with the right protections in place for yourself, you may find it a very rewarding one in the end. Best of luck to all.